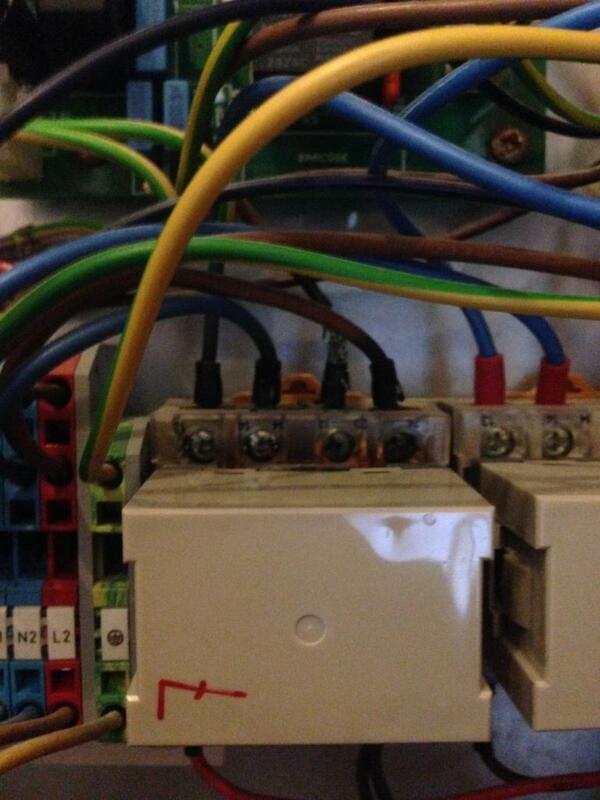 Burnt out contactor, corroded cables, spurious voltages and no hot water. Hi All, please bare with me on this. 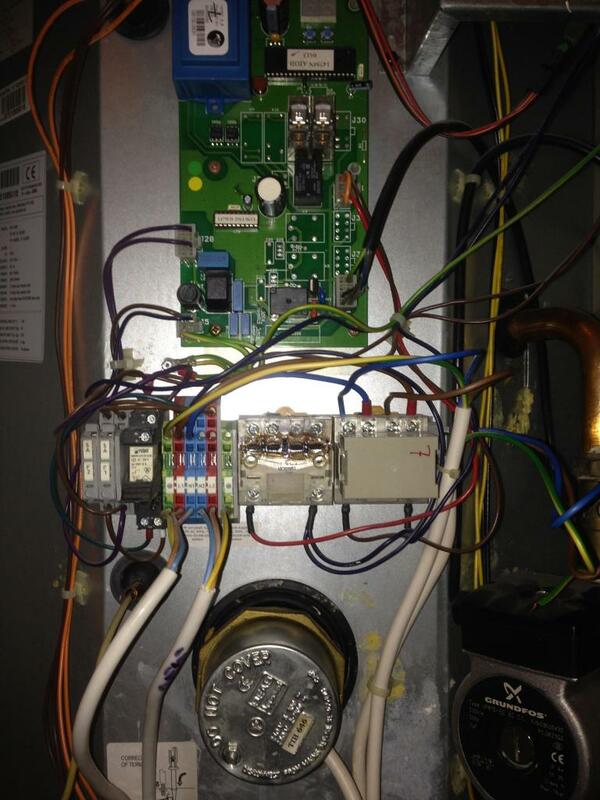 I'm an electrician with experience of automation and control but none on this boiler! Pulsacoil A class with both on peak and off peak feeds, the off peak being switched through a time clock. I was called to a friends flat where she has had no hot water for eight weeks. I was presented with an empty header tank, a burnt out 'on peak' contactor and contactor carrier, a story of it leaking a couple of years ago (no more details on that) and how she can never have a bath unless the booster button is used. 12Vdc and negligible AC voltage on coil side of 'on peak' contactor, 21Vdc and negligible AC voltage on coil side of 'off peak' contactor. When the coil is pulled in on the 'on peak' coil, the DC voltage is replaced with 230Vac. Is the DC voltage a fault, is it part of the diagnostics? btw, both contactors have 230Vac coils. Both heating elements read 19 Ohms which is near as damnit correct for a 3Kw heating element and both have been used to heat the water when fed with 230Vac to test. As a get out of jail fix i wired the on peak supply to the feed side of the off peak contactor and wired the bottom immersion heating element to the load side. This gave her hot water when needed for the three days until i could source a new contactor and carrier. New parts arrive and i wired it up how it was before, 'on peak' supplying the left hand contactor which in turn fed the the bottom immersion element and the 'off peak' supplying the right hand contactor and in turn feeding the top immersion element. When the boiler was initially turned on, the new 'on peak' contactor (exact omron replacement, correct rating) did start to chatter long after the 'off peak' contactor had fell silent but this went away after switching the boiler off and then on again. Checked coil voltage again and found 20Vdc instead of the initial 12Vdc on the 'on peak' contactor coil and 21Vdc on the 'off peak' contactor coil. Strange. The hot taps had been run so the water in the tank was now cold and the plate heat exchanger was now warmish but found both contactors were not switching to heat the water back up, the right hand 'off peak' contactor was not switching because it could not see an 'off peak' voltage (normal) but the left hand 'on peak' would not switch either, even when the boost button was pressed. Diagnostics said "s6 sensor shorted", cannot remember off hand but got a high resistance of this sensor in the tens of K-ohms. it also said S6 sensor calling, there is an 'on peak supply present and that the 'on peak' heater was on, which it wasn't. i'm not sure how a sensor can throw up "shorted" as a fault code but still recognise it as "calling". I wired the on peak supply to the right hand 'off peak' contactors supply, pressed the boost button and the contactor switched giving 230V on the immersion to get her out of trouble and this is where i am with it. I cannot explain the DC voltages, why the on peak contactor will not switch (duff sensor? ), or why the off peak contactor IS switching when the boost button is pressed even though the off peak is isolated. both 5A din rail fuses are ok. I think that's about it, sorry my description is a mess. If you need clarifying on anything then please shout. These photos were taken after i had wired it to give her heating so ignore cable locations. Re: Burnt out contactor, corroded cables, spurious voltages and no hot water.